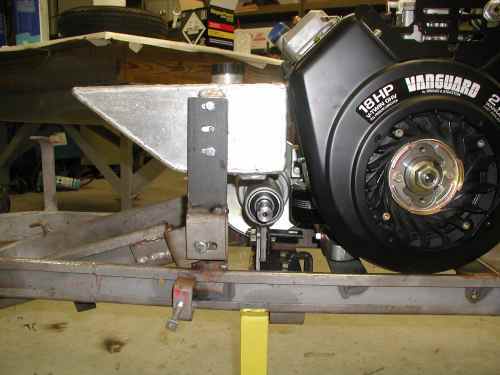 Pictured on this page is my Cushman Model 52 Vanguard conversion. I plan to completely assemble and road test the entire conversion, then knock it all back down for final sand blasting, priming and painting. The sheet metal is completely finished and ready to install. The first thing that became very obvious was that there was no room for the jackshaft and the conversion appeared to be impossible. I removed the brackets that hold the swing arm, turned them around, and welding them back to the frame in the same spot. The swing arm was widened at the front to fit the new bracket width. This allowed the jackshaft with the Comet driven pulley and the drive out sprocket to fit between the swing arm brackets. The jackshaft is located directly on the former transmission bracket. A support brace goes from near the top of the jackshaft to the engine but it is not shown in the pictures. 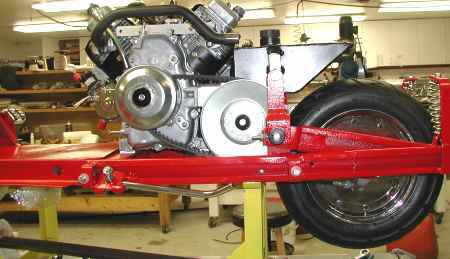 The other vertical brackets are used to mount the gas tank as shown in a later picture. 1/4 x 2 reinforcement plates were welded across the existing motor mount rails. There is a 1/4 inch aluminum bar spacer under the engine mounting bosses at the front and rear to raise the engine just enough to allow the shroud to clear the side rail. 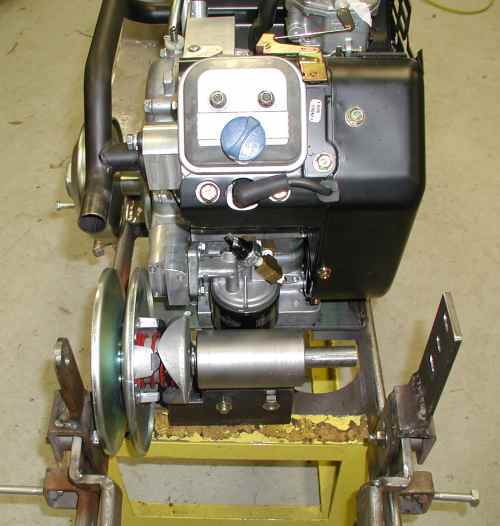 The engine is mounted as far to the left as will allow the Comet clutch to clear the sheet metal cover. This leaves approximately 1-3/4 inches of space between the Vanguard shroud and the sheet metal on the right side. I left as much space here as possible to avoid restricting the air intake. Since the air intake is now on the right side the louvers are backwards, so it remains to be seen how hot the engine will run. April 2, 2001 Update: More pictures posted below. All is finished except for painting and installing the front fork and finishing a portion of the wiring harness. . A front brake was fabricated using a new dust shield and a drum from an old Highlander. The cam, heel pin and activating lever were fabricated. 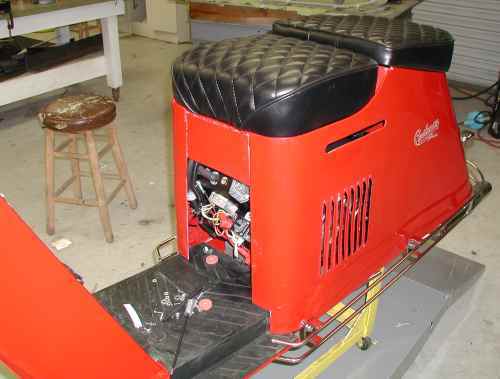 The handlebars were cut off and a chrome later model handlebar was installed using standard Cushman mounts. 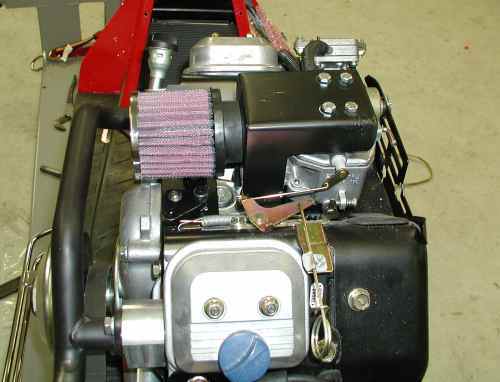 The standard Cushman throttle cam to activate the carburetor bell crank. 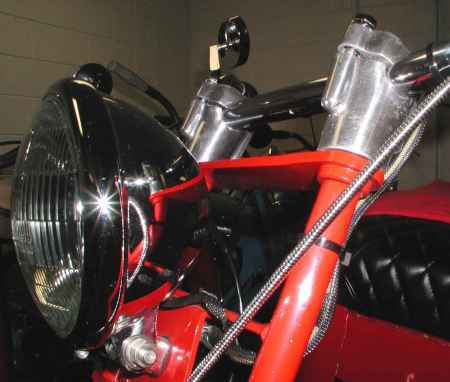 The handlebar assembly is complexly finished and includes two of Steve Lorenz's fantastic oval mirrors. 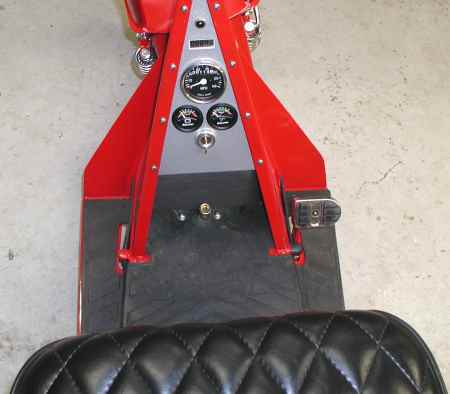 The right end of the handlebar has been adapted to the standard Cushman twist grip by crushing it to the proper size and cutting slots for the cam to run in. A bell crank is located on a bracket mounted to the engine. 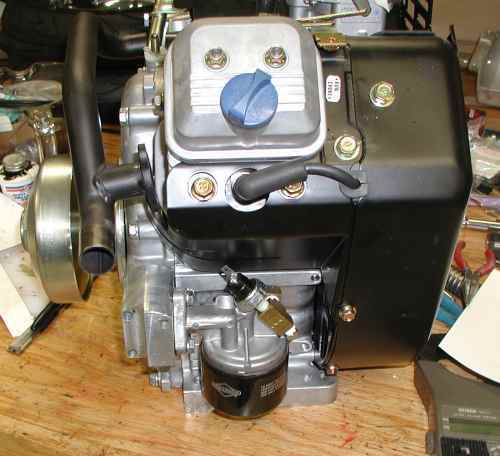 A bell crank is used because the Vanguard carburetor pushes to increase speed. The bell crank reverses this so that the twist cam can pull to increase speed. It also has a slight mechanical advantage to allow the use of the full twist grip range. 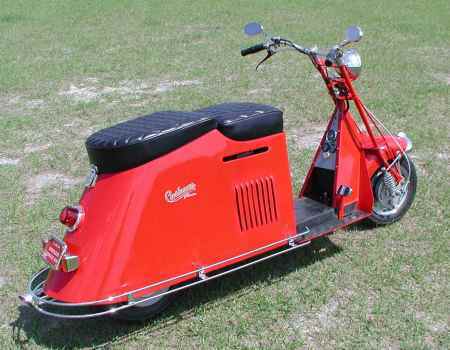 The scooter will have a speedometer driven from the rear wheel with a concealed cable. A mini console will be located in the upper fork support area with the speedometer, an electrical oil pressure gauge and a volt meter. The battery will be located in the bottom of this area, concealed by a vertical panel covered with rubber matting. The foot dimmer switch will be relocated rearward to just enough to clear this panel. 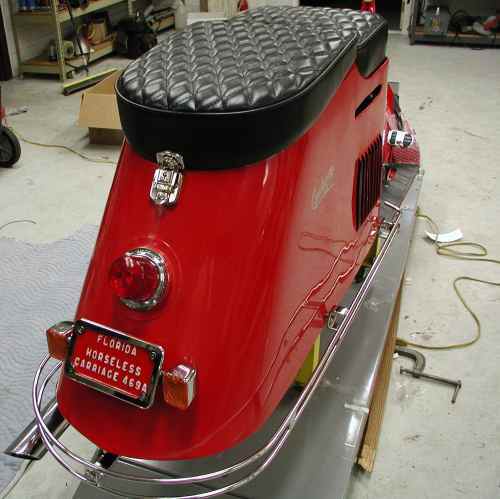 Turn signals will be installed at the rear of the scooter only. They will be mounted to each side of a chrome after-market license plate holder. The engine starter solenoid will be interlocked through the brake light switch so that it will not start unless the brake petal is depressed. This is an absolute must for any Vanguard conversion; if the carburetor is open when you hit the starter switch you may not be able to react quick enough to avoid an accident. At this point the engine and jackshaft still refused to co-exist because the oil filter hit the jackshaft. 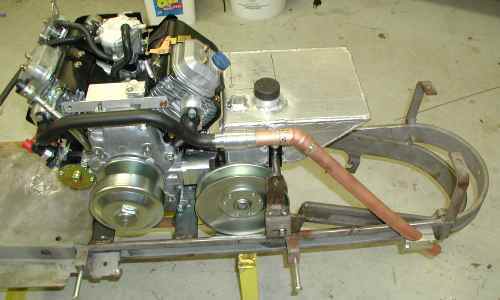 It was necessary to make an angle adaptor out of a block of aluminum to tuck the oil filter up close behind the engine. I could also have use the Briggs remote oil filter kit, or just purchased the block-off plate and gone without a filter. Note that plumbing is provided for both the original oil light sensor and the new electric oil pressure sensor. The oil pressure warning light on the dash does double duty as a turn signal flasher indicator. I am using a shaft to shaft spacing of 8-5/8 inch with the appropriate Comet belt. 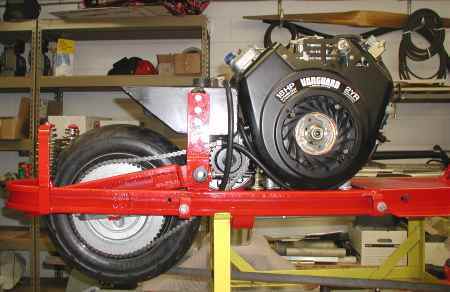 This model Cushman uses a single bracket for mounting the transmission. It looks strong, but it is totally inadequate for the jackshaft. I added a brace from just below the barrel of the jackshaft to the rear of the engine to keep the bracket from flexing. The brackets for the gas tank can also be seen in this picture. Yes, that oil filter can be changed without removing anything! The gas tank is slanted at the rear to allow clearance for one of Steve Lorenz's 10 inch tires. The tank looks small, but it holds slightly more than an Eagle gas tank. It will have a tight seal cap and a remote vent tube with a flame arrestor. The top of the tank fits just under the rear storage compartment floor on the sheet metal cover. This picture of the left side shows the overall assembly and the exhaust pipe. Dual exhaust was just not practical and the single pipe will work just fine. Note the aluminum spacers on the manifold to space it out from the engine. They can also be seen in the previous picture. If I can find space for an air cleaner I will be about ready to ride. 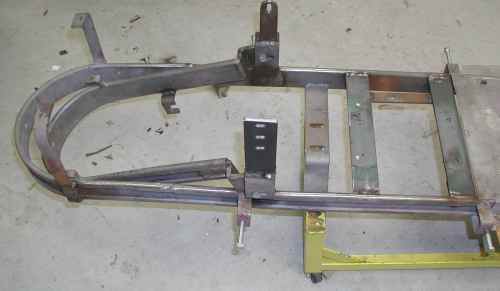 The kick stand bracket will have to be removed and put back on at a greater angle to obtain a satisfactory lean angle with the larger tires. Note: The exhaust system shown here was replaced by a flex tube and a muffler. See the later picture below. 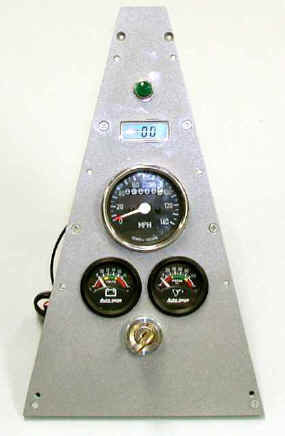 This pictures shows the control panel which has a tachometer, speedometer, volt meter, electric oil pressure meter, key switch and an indicator lamp which does double duty as a low oil pressure warning light and a turn signal indicator light. It fits in behind the ledge in the compartment below the handlebars. the countersunk screws along the edge are concealed by the rim of the compartment. The fabrication of the wiring harness is underway. The engine and all the running gear has been tested. As soon as the wiring harness is finished I will be ready to disassemble everything for painting. All finished from the engine to the rear end. but this one is grandfathered forever. Well, it is finished at last. I cannot believe how complicated the wiring harness was. It must have five miles of wire in it. I took it for a shake-down cruse to a county park and took the two pictures shown at the end of this page. It runs pretty hot inside the metal cover, and I plan to experiment with insulating the exhaust system. I also plan to make a Cherry-Bomb muffler insert and a set of buddy pegs that fold up inside the chrome rail. Addendum April 14, 2001 It looks like I will have to relocate the gas tank to the storage compartment. The engine is adequately cooled all bundled up, but the gas tank gets too hot. Not too bad as long as air is circulating, but the tank temperature soars after a ride from all the heat retained within the enclosure. It has about 40 miles on it now and runs great. Addendum April 23, 2001 If you do a Step-Thru, especially a narrow 50 Series like this one do not try to locate the gas tank in the engine area because it is much too hot. I tried insulating the exhaust system with "hot rod" exhaust tape and it cooled the compartment considerable, but not enough for the gas tank. The engine cylinder head temperature was not affected at all by the tape job since it gets its cool air from the other side. I removed the original wedge shaped gas tank and built a new custom aluminum tank for the cargo area. I also insulated the front wall and bottom of the cargo area with 1/2 of insulation and covered it with custom fit pieces of .060 aluminum plate. The tank runs cool and the gas mileage increased considerably. It is still vented to the outside. The scooter has 110 miles on it now and today got it's first experience on the Polk Parkway. Storage Compartment showing new Gas Tank. 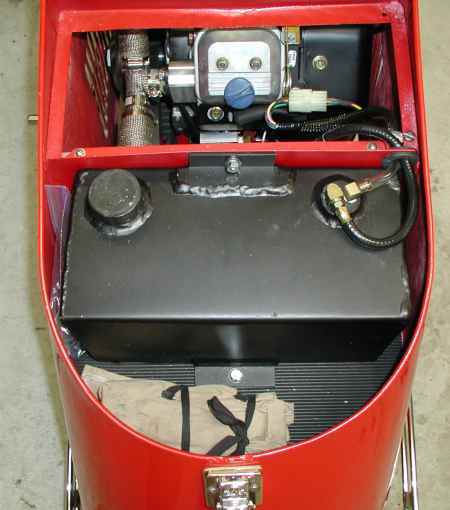 One hose is a quick-disconnect for the gas to the carburetor, the other is a vent tube that stays with the sheet metal cover. It is a little hard to see in the picture, but there is a vertical panel covered with floor mat material that extends from the floor to up behind the panel. It hides a small 12AH sealed lead-acid wet cell. The sealed cells are smaller and have a higher CCA rating than their "add water now and then" cousins. The dimmer switch has been moved rearward enough to make room for the battery. I did not have a key for the rear latch so I called Andersen Cycle & Key here in Winter Haven, FL (Established 1948) I jokingly asked for a rear latch key for a 1946 Cushman Scooter and he asked me what key number was on the lock. He still had it in stock! This thing is super fun to drive gets more attention than any Eagle ever did! I have several requests for more information about replacing the original weld-on handlebars with the later chrome bars. It is very easy to do. Start by cutting the upper fork tubes off squarely at the appropriate height. A large tubing cutter works best. The aluminum risers will add a couple inches to the height, so plan accordingly. Make a pair of steel inserts that will fit down into the fork tube. The overall length of the insert is approximately two inches and the upper 1/8 inch is about 3/8 larger in diameter to serves both as a stop to keep the insert from going too far down in the fork tube and as a mounting flange for the aluminum risers. You can see this flange in the picture just below the cross plate. Both of the inserts are threaded 3/8-24. To secure the insert drill a 5/16 inch hole in the side of each fork tube. Press the insert in place and spot weld the insert to the fork tube through the 5/16 inch hole. A little light filing will smooth it up for painting. The aluminum risers are secured to the inserts with a 3/8-24 Allen head cap screw. The inside of the aluminum riser is drilled larger just far enough to recess the head of the cap screw and allow the handlebars to sit in place. The cross bar shown in the picture is just a piece of aluminum (or steel) that has two 3/8 inch holes drilled in it. It is fastened with the same screws that secure the risers.